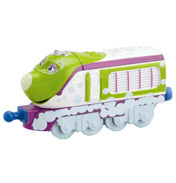 Whether your child would like to recreate their favourite Chuggington episodes or with a little imagination start a whole new set of adventures, they can use the brightly coloured and durable die-cast versions of these wonderful characters. Alternatively sit and relax with a beautiful jigsaw puzzle depicting scenes from the shows or a card game. Or, if you are feeling especially creative, have a go at creating your own characters from dough. The busy world of Chuggington was created in 2008 and follows the exploits of three apprentice engines (called “TRAINees” of course) who are each learning to ride the rails and complete essential daily tasks correctly and in doing so they help themselves and the people of Chuggington. The three main characters are Koko, Wilson and Brewster. They each have their own unique character traits but they, and all the other characters in this magical land, are based physically on real life modern trains of every kind from streamlined diesel locomotives and electric bullet trains to trolleys and old steam engines. The show has an effective role in teaching children important life values such as friendship, honesty, perseverance and much more. See the Toy range below, or watch the video on the Training Yard Loop Set!